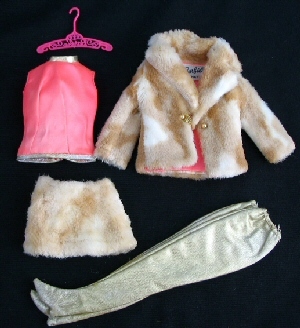 This set has a tan & white faux fur mini skirt and a matching jacket. The jacket has gold bead buttons and chain closure & is lined in hot pink satin. The sleeveless top is the same hot pink satin with gold braid trim at the neckline and bottom hem. The Gold Boots are really knit pants/tights. The golden color of the boots is very prone to discoloration. They should be very bright metallic gold (like the trim on the top), but is is hard to find ones that have not faded over the years.